To remove the viscous fan, am I correct in thinking that as you look at the fan from the front, its a left hand thread? Do you know what a nemesis is? It’s a right hand thread. Anti-clockwise for removal. Jon. Defender 90 TD5 CSW - The longer I own it, the newer it gets!! 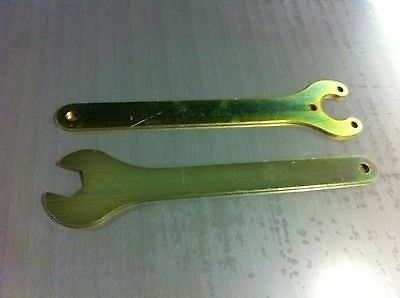 I bought a spanner off the web - what I'd have thought would have been a decent thing, and it was carp. The fan may not have been off in a while, so it was tight, but not excessively I wouldn't have said. The jaws just opened up and deformed. I ended up taking a grinder to a 32mm spanner I had, to thin it down enough. Worked perfectly. This was in a Tdi, and I've never had to do anything on a TD5, so it might be different. 2005 G4 Discovery III 4.4 V8 (2008-2018) It's gone but it still hurts. Glad you got sorted John, sounds like you're doing some work on her!! Here's the spanners to go for, mine have the td5 and v8 logo stamped in them though. Not done any work yet. Ordered a new fan unit and service kit today. Viscous fan off - with the help of a copper hammer. The fan spanner wouldn't budge, so a quick knock with a hammer gave enough to move the spanner. All in all not a bad job with the right tools.